$1,899.99 & FREE Shipping on orders over $59. 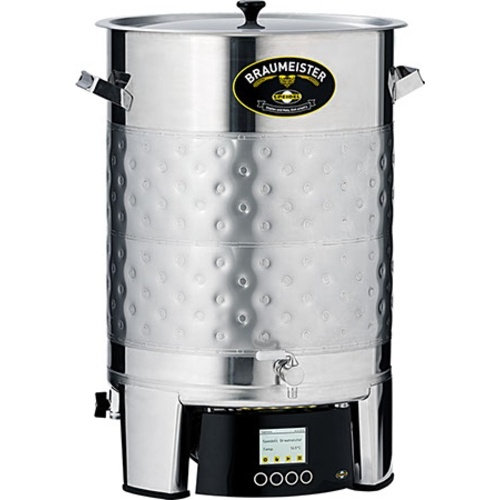 The Braumeister Plus models have been further improved with a welded jacket, eliminating the need for a separate wort chiller. These jackets have 1" male threading, and aside from cooling, also serve as additional insulation to help you during heating. A Dump Valve tap has been added to the base of the unit to make emptying and cleaning that much easier as well. You need to have a source of 220v power(and the ability to adapt the European plug to North American 220v, we recommend a certified electrician). If you have that then using electricity can become an advantage. Because of size constraints of the mash tub the largest starting gravity beer you can brew is between 1.060 to 1.065. You can always add DME to the boil for an occasional big beer brew. These units require a 220/230v connection. You should plan on hiring an electrician to install the proper socket and to wire on the appropriate plug. I've seen reviews that claim the jacket chiller is ineffective. Is this true? I'm curious if this model actually needs the white insulating jacket that is sold separately? I know it is for the BM20 original but is it needed with this built in jacketed version?